Atahualpa was born on March 20, 1497, in Cuzco, Peru. He was the son of Inca Huayna Capac and Princess Duchicela of Quitos. By 1527, European diseases had made their way to Peru. The diseases, which included small pox and measles, had moved at an amazingly fast pace. First, it killed Huayna Capac, and then it would quickly kill his son Ninan Cuyoche who Huayna had chosen on his death bed to be his successor. Ninan Cuyoche's death set off a dynastic struggle for the throne between Atahualpa, and another of Huayna Capac's sons named Huascar. This would become known as the War Between Brothers. The two sons were half-brothers from different clans or lineages. They were not very much alike. Atahualpa had been raised by his father, and he had an avid interest in the military. Huascar was know to be a womanizer and drinker. Both were in their mid-twenties and had horrible tempers. They both believed that they were entitled to the crown. Tensions between the two increased until Huascar decided to attack Atahualpa. Atahualpa would emerge victoriously in what would become an all out civil war. He would then kill Huascar and his entire family. In all, over 150,000 people died as a result of the war. Atahualpa's victory was short lived. Only days later he heard tales of Pizarro and his 167 men riding on top of giant animals. The Spaniards were burning people at the stake. Although the Inca vastly outnumbered the Spaniards, the Incas were at a disadvantage because their weapons were crude and largely devoted to hurling rocks. Their army wore wicker helmets and had shields made of cotton, and they couldn't stop a bullet, sword, or cannon ball. Pizarro came up with a master plan. The night before he was to meet Atahualpa he hid his men in the Cajamarca town square and waited until it filled with six thousand Incan soldiers. Then, when the square was finally filled to capacity, Pizarro discharged his four cannons at point blank range leaving swaths of dead Inca soldiers. This immediately sent panic through the Inca ranks as everyone began to run. Simultaneously, the cavalry attacked from all sides. Quickly, the Spaniards cut down the remaining soldiers with lances, and steel swords. The Inca soldiers, never having seen horses or steel weapons before were frightened to death, and many died in the stampede that ensued. While the battle raged Francisco Pizarro and seven horsemen fought and slashed their way until they reached Atahualpa. Atahualpa was seated on his litter when the Spaniards overturned it. In less than two hours the Inca Empire had fallen. Amazingly, the Spaniards did not lose a man. The Inca Army had lost as many as six thousand. 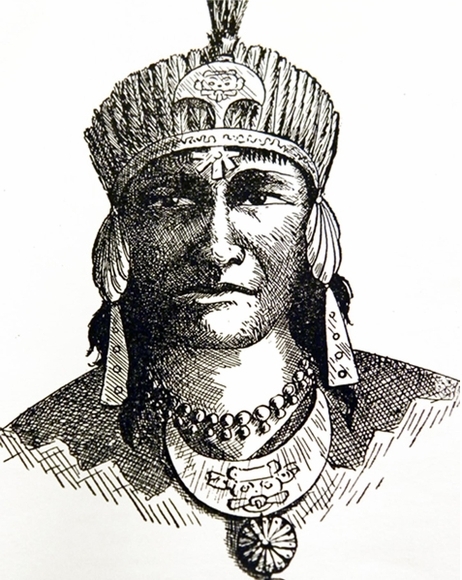 Kidnapped and held prisoner for weeks Atahualpa became desperate. He decided to cut a deal with Pizarro and gain his freedom. Atahualpa promised Pizarro and his men that he would fill up one of the rooms in the Temple of the Sun with gold and silver six feet height if they let him go. Atahualpa told Pizarro that most of the gold and silver was in Cuzco, and it could take up to a year to collect. Atahualpa was trying to stall for time, hoping for a way out. It would take weeks before the gold and silver would start arriving. As it arrived the Spaniards carefully weighed it, and melted it into bars. Between, March and July of 1533, the Spaniards took in more than 40,000 pounds of silver and gold. When the last of the gold and silver was distributed Atahualpa began to worry. Then, one day, Pizarro had a chain placed around Atahualpa's neck, and called his men together to decide his fate. On Saturday, July 26, 1533, a group of Spaniards led Atahualpa to the middle of the same town square where his men had been slaughtered, and he had been captured. Atahualpa was dressed in a rich tunic and mantle as he pleaded for mercy. He was told that it would only come if he converted to Christianity. At that, he was baptized by Dominican friar Vincente de Valverde. Then, as the sun set they tied a garotte around his neck, and turned it like a wheel until the blood was cut off to his brain.